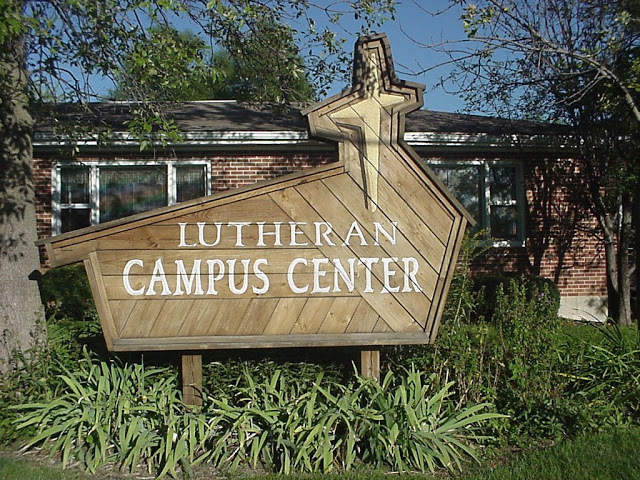 The Lutheran Campus Center is where LSF activities usually meet. The LCC is an 8 bedroom, 5 bathroom, 4 kitchen house located across the street from Ryle Hall. In addition to the living quarters for students, we also have a main room where Bible Studies meet, a pool table, a ping-pong table, and lots and lots of (aesthetically impaired, yet incredibly comfortable) couches. You’re welcome to come over and visit any time – and there’s no need to knock! Wait, what did you say?!? Don’t be confused – the LCC goes by a lot of different names. Some of the more mundane ones: “Lutheran Campus Center,” “Lutheran House,” and “Lutheran Student Center.” Some of the shorter ones: “The LuHo,” “The House,” and “The LCC.” But don’t worry, they all refer to the same building! Glad you asked! The house is located at 1307 S. Florence Street, just down the street from the football stadium and across the Pershing/Ryle parking lot. From Highway 63, go west on Patterson and take a left on Florence. It’ll be the first house on your left. From campus, head to Ryle Hall and look for the house on Florence Street directly behind Ryle! Who lives at the House? Lots and lots of students! Sophomores and up are eligible to live at the LCC. The LCC provides its residents with convenient access to LSF activities, a Christian living environment, and some of the closest-to-campus off-campus rooms available in Kirksville. In addition to the ones who pay rent, some people are over at the house so often that they “live” there too. Basically, any student interested in LSF is invited to live (or “live”) at the LCC. Applications to live at the LCC are typically made available early in the Spring semester each year. When they are, an announcement will be made in the LSF Weekly Email.